Fun With MagicBox is a unique variety of event initiated by MagicBox Animation, to load traditional values into kids in a fun and entertaining method. 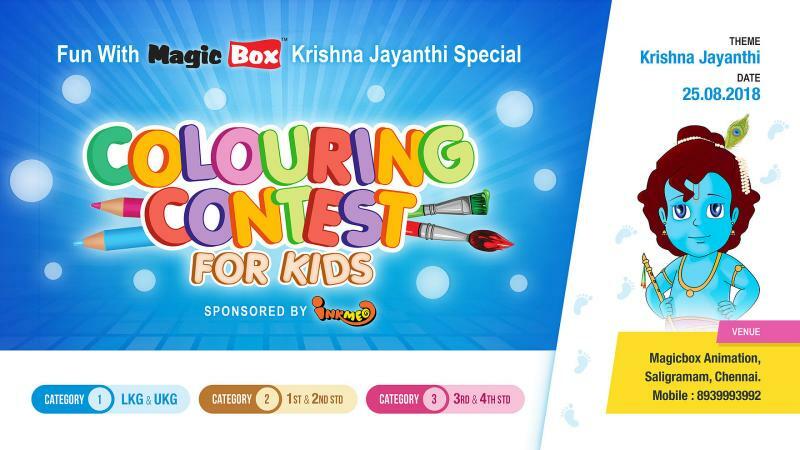 This Krishna Jayanthi special event on the 25th of August 2018, is a chance for your kids artistic talent to shine through the colours of Krishna. Right from 9:30 am to 1:30pm. Come with your favourite art tools and splash the colours across the images and showcase your creativity. Prizes await those outstanding colouring talent. • All participants may register online or on spot and proceed with the competition. • The decision of MagicBox about the winners will be final and binding. No correspondence in any matter will be entertained.